This is very tasty indian kulcha recipe. Kulcha is very tasty and very easty to cook at home. First of all take a bowl than add sugar, salt and baking soda in it and mix it well. Add 3 tbsp curd/yogurt in it and mix it again. Now add little water and mix it into soft dough. Now add little oil and roll it to make dough smooth. Cover the dough with wet cloth and leave it for 2-3 hours. After 2-3 hours remove the cloth and knead it once again. Make equal size of 4-5 dough balls. Now take a dough ball and dust it with dry flour and roll it in oval shape. sprinkle some nigella seed and fenugreek seed and roll it again. Now repeat the process and roll the remaining balls properly in oval shape and than cover it with wet cloth for 30 minutes. Now turn on the pan and heat a non-stick tawa and gently put the kulcha on tawa and cook it for 1/2 minute on low flame. After 1/2 minute flip the kulcha and apply some butter/ghee . Now flip it again and apply butter/ghee. Heat a iron tawa and apply little water on top of kulcha. Now place the water applied part on tawa to stick and once the bubble starts than flip the tawa and cook it till it turns light golden. Repeat the process and cook the remaining kulcha by this process. 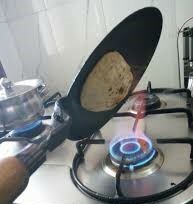 Now heat a non stick tawa and and put the kulcha on it. apply butter on both sides and cook it properly. Once it turn golden brown take it out and serve it with chole masala.